Synopsis: A young African-American man visits his Caucasian girlfriend’s mysterious family estate. Jordan Peele is best known as a comedian from his stint on “MADtv” and as the “Peele” half of “Key & Peele.” But anyone who has read any interviews with him or listened to him on a podcast knows that he is a big horror buff. Horror movie Midas Blumhouse Productions has given Peele a shot behind the camera, letting him write and direct Get Out. 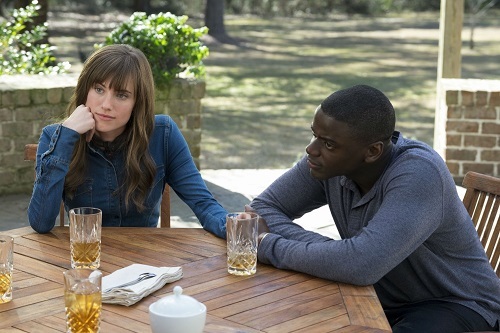 Get Out is about a young African-American man named Chris Washington (Sicario‘s Daniel Kaluuya) who heads off for a weekend at the suburban country home of the parents of his (white) girlfriend, Rose Armitage (Allison Williams from “Girls”). 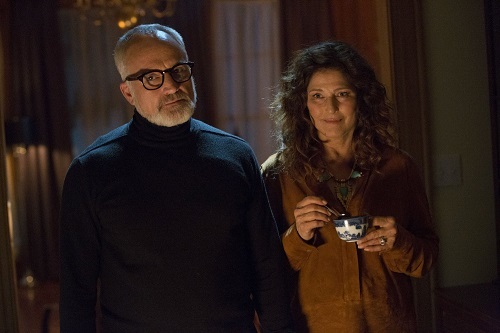 Rose has neglected to tell her parents that her boyfriend is black, so Chris is understandably uncomfortable to meet Dean and Missy Armitage (Bradley Whitford from The Cabin in the Woods and Catherine Keener from Captain Phillips, respectively), and he grows warier as he notices that all of their household servants are black. Chris’ first impressions don’t prepare him for what the rest of the weekend has in store for him. Jordan Peele knows his movies. 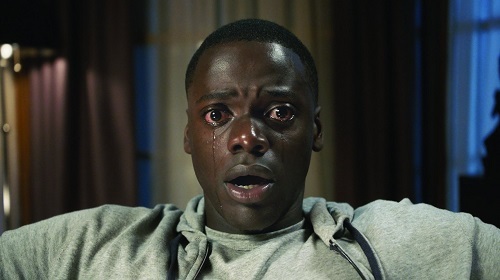 It seems like what he has done with Get Out is toss bits of The Purge, Hostel, The Invitation, Tusk, and The Skeleton Key into a blender, then sprinkle in a bit of Do the Right Thing, Guess Who’s Coming to Dinner, and The Stepford Wives, and finally, mix it all on high until it comes out as something purely original. That may sound like a weird mix of influences, but it all makes perfect sense within the context of the movie. Get Out takes its sweet time getting where it’s going, but it’s an awfully fun ride. There are twists and turns all over the place, and the movie changes gears at every stop. It’s a tough one to figure out while it’s being watched, and that’s the idea. It keeps the viewer guessing. Of course, racism plays into the story in Get Out, but not in the way that one would expect. It would have been easy for Jordan Peele to write a simple story about a black man who falls victim to his white girlfriend’s family and their friends who ignorantly torture and torment him. But Get Out is smarter about it. It’s got the same social conscience, but it’s more subversive and, therefore, more entertaining. Much like the old episodes of “The Twilight Zone,” the audience hardly realizes that it’s being taught a lesson as it watches. Get Out is one of those movies that is best-experienced cold. Meaning, don’t prepare for it, just go see it before it gets spoiled. And, at the risk of spoiling anything further, that’s all we’re going to say about that. Although Get Out is first and foremost a suspenseful thriller, Jordan Peele doesn’t let himself stray too far from his comedic roots. There are some genuinely hysterical moments in Get Out, mostly courtesy of LilRel Howery from “The Carmichael Show,” who plays Chris’ best friend, a TSA agent who figures out that something isn’t right and tries to help. The humor is, however, used sparingly, and usually only as a tension breaker, sort of like how humor is used in movies like Scream or the later A Nightmare on Elm Street movies. You won’t go to Get Out for the laughs, but it will get a few of them out of you. Get Out is a deliberately slow-burning potboiler of a movie, but it has few real scares. It’s the ideas behind the movie that are scariest, and not just the bigotry and prejudice. Put it this way; it’s not coincidental that Rose’s father is a neurosurgeon and her mother is a psychiatrist. It’s all part of the crazy, messed up storyline. Rose’s brother, Jeremy (Caleb Landry Jones from Stonewall and Byzantium), is a certifiable psychopath (even if his jujitsu skills are a little weak), and he’s the wild card, but all of the Caucasian characters are absolute monsters. But as far as scream-out-loud scares, there are very few. The ones that are attempted are the cheap types that will only be effective in a packed theater, so if you want to be frightened by Get Out, see it with a crowd. That’s good advice anyway since it’s the type of movie which has fun plot points that are usually spoiled by the internet after opening weekend.